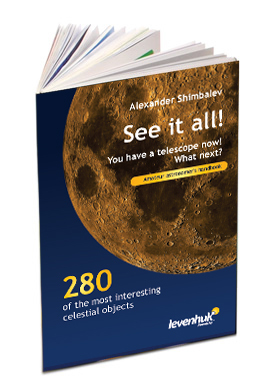 Levenhuk Strike NG Telescopes are a brand new series for amateur astronomers. Levenhuk Strike NG telescopes are a wise choice for those who don’t want to spend time assembling and adjusting a telescope, or browsing through an expansive list of accessories. Apart from the telescope itself, you also get the optics for astronomical and terrestrial observations, and informative astronomy handbooks for both amateurs and more advanced users. All this makes the Levenhuk Strike NG Telescope an ideal choice for any beginning astronomer interested in science. Three posters showing the cosmos as we know it. Each poster presents interesting information on various celestial objects in an easy-to-read format. The posters are 84×60 cm (33×24 in), printed on glossy coated paper. Moon Poster. You will find out about the history of lunar exploration, learn all the characteristics of the Earth’s satellite, and find answers to many questions that interest mankind, including the nature of dark spots on the lunar surface.